B, my little prune, that’s what you are this summer. Your fingers are permanently wrinkled and your toes too. You don’t mind. You see any source of water, be it a pool, lake, beach, river or bath you get all giddy. I love that you love swimming so much. Your confidence in the water is improving every day. I can where your swimming lessons have come in handy. You are trying to get your sister to love the (icy) water as much as you. Even Mommy can’t handle how cold the water is at first when we fill the pool as it comes from deep underground from a well. It’s so cold it almost burns my legs until the sun has had a chance to warm it up. But you dive in like it’s no big deal. I love how much fun you are having here at your grandparents house and I hope you have these memories forever. You asked me the other day why we can’t always come here, it was a tough question but I tried to explain the best way I knew how. It got me a little emotional but I love our life back home too. I told you how lucky you are to have two places to call home. I hope you understand that one day. You are a very lucky little boy. MM, stop growing up right this minute young lady. Your hair is growing longer and longer, your eyes are getting bluer and bluer and glimpse of my baby are going away forever and this little girl stands before me. We have been trying to potty train you this week but not sure if it’s the right time for you. You just don’t want to partake. 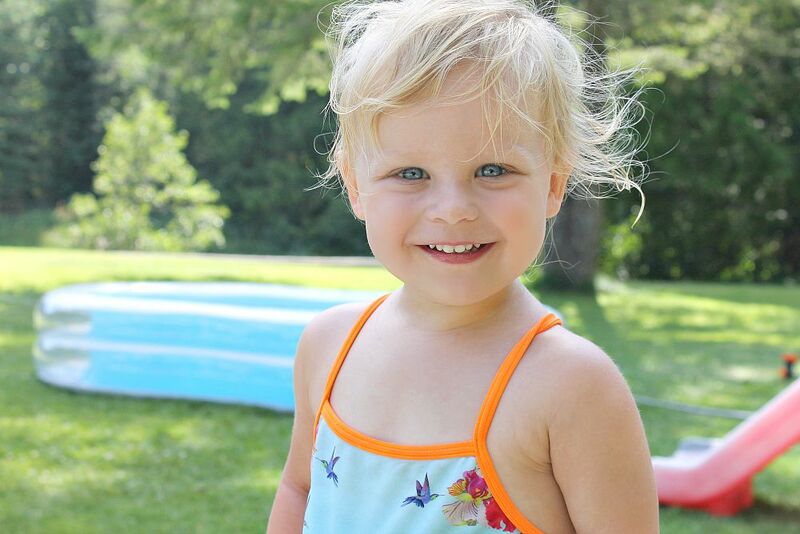 We have been swimming lots and play outdoors lots this summer which makes you light up although you aren’t the fish I thought you were or just a diva and prefer a warmer pool temperature. Either way, you love the space to run and be free outdoors. You have done so much better this year with the car rides as Grandma lives 45 minutes away from anything even the grocery store, we spend lots of time driving. Last year, you couldn’t cope with the hours in the car and this year you stay entertained by your brother and the wildlife out your window. This year you can do so much more than you could last year and it makes for great impromptu days out. You are a great little traveler now. I think he is more like me than I originally thought. True water baby. I would too. Especially when it’s this hot outside all the time. 🙂 Thank you. Sounds like you are still having a wonderful summer! Looks like gorgeous weather. 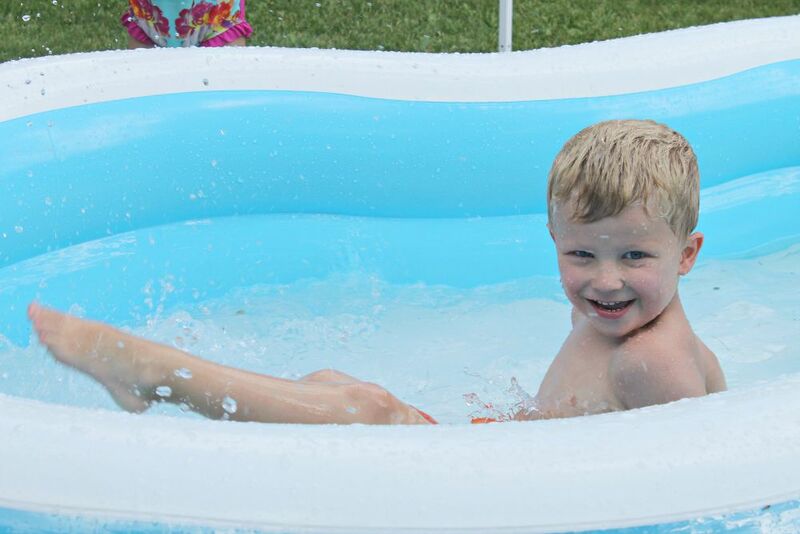 My eldest doesn’t seem to notice the cold water either – guess it’s good to be hardy! Yes always good to be tough skinned for sure. Summer is still in full bloom and we have four more weeks of it. Thank you so much. Loving it here with my family and being home. I know I feel the same exact way and I am seeing her change every day right before my eyes I swear it. We all are enjoying the slow pace of life and kickin’ back with family around us. Thanks Donna. Hooray for the summer and grandma’s house! Your beauties are getting so big. I know that feeling of wanting to slow down time, but you treasure each day so well! Yes Grandma and Papa’s house is disneyland for us all. I love being home. Slow pace of life lately has been so good for us all. Thank you Emily. Oh Jenny that photo of MM is adorable – she seems to be changing right before our eyes and becoming a proper little girl. I just love seeing the outdoor photos, it just makes me think of how special these memories will be for all of you as they grow up! I hope they remember these summers here as little as they are I always wonder if they will forget. MM is changing so much every day. Even I can see it and I see her every day. It’s amazing. They grow up way too fast.